This sounds as if you believe that the coils in front are weaker and are compressing before the coils to the rear begin to add their tension. The spring hasn't any knowledge as to which end is moving, front to rear, or rear to front, but does respond to being compressed, all coils compress the same at the same time as they are the same. This being true for a standard wound spring where all coils are wound with the same distance between coils. Your description sounds close to a variable rate spring, where say half the coils are wound half as close to each other as the other half. Then the close coils will move more in relation to the coils spaced further apart. This spring the allows for the slide to more easily begin to retract, but will still have the higher weight of the coils of full space when fully compressed. No, I don't believe the coils in front are weaker. I was trying (apparently unsuccessfully) to explain why the illustration provided earlier by megafiddle was misleading. It isn't the distance moved by any portion of the spring that determines the amount of force/energy stored up in the spring, it's the torsion in the wire. And that is constant through the length of the coil (unless it's a variable rate spring), regardless of whether you look at the "fixed" end of the spring or the enbd that moves. There are two ways (that I'm aware of) to make a variable rate spring. One way is to vary the coil spacing, such that some coils bottom out before other coils, thereby changing the effective rate of the portion of the spring that's still active. The other is to use wire of a varying diameter. The latter approach has been used in automotive coil springs, which are big enough to make that approach viable. I'm not sure that's a viable approach for gun springs, but I've never seen one of Wolff's variable rate springs so I don't know which approach they use. I see both ends are as fixed, as the other, and all the coils compress respectively the same as the load is applied. What is stuning to many the first time they read it is each coil of a #16 recoil spring produces #16 at near full compression the same as the entire length when compressed to near full compression. The number of coils has nothing to do with the total spring weight when compressed to full compression. Wolff variable rate springs are as I described them, and is easy to see the different coil spacing in half the spring. A coil spring is basically a torsion rod wound into a coil. If one end of a straight steel rod is clamped in a vise, and torque is applied to the free end, the rod will function as a basic torsion rod. The applied stress (force) is in the form of torque (twisting force), and the rod's response is in the form of torsional strain (twist). The applied torque could be provided by a lever and might be measured in ft lbs. The resulting strain might be measured in degrees of rotation of the free end. Therefore, the spring rate of a torsion rod might be measured in ft lbs per degree. The spring rate of a torsion rod is inversely proportion to its active* length. If the length is doubled, the spring rate will be halved. If the length is tripled, the spring rate will be reduced to one third. This characteristic carries over to the coil spring. In the case of the coil spring, it's more convenient to think of the length in terms of number of active* coils rather than length of the spring wire. The relationship is still the same though. The number of active coils is directly related to the active length of wire that makes up those coils. So if the number of coils were doubled, the spring rate would be halved, etc. One important difference between the torsion rod and coil spring is in the way the stress is applied. For a torsion rod, it's in the form of a torque. For a coil spring, it's in the form of an axial force (the coil's axis, not the wire's axis). Also, the spring rate is therefore expressed differently: ft lbs per degree for the torsion rod, and lbs per axial compression for the coil spring. The response for both is the same though. It results in the spring wire or rod being strained torsionally (twisted). It should be apparent that the ends of the coil wire will rotate as the coil is compressed axially. It should be apparent here that the amount of rotation at the open ends will be the same as that for a single coil, for full compression of the spring. It should also be possible to imagine that we can add as many coils as we like with no change in the amount of rotation at the open ends of the spring wire at full compression. Furthermore, whatever is happening at each individual coil, must be also be happening at every other coil. The torsional strain should occur along the entire length of the spring, with each coil undergoing equal strain. And since the coils are effectively in series with each other, and oriented in exactly the same way in relation to each other, there should be an accumulation of torsional strain over the length of the spring. More coils, more total overall rotation. Yet there is no difference in the total tortional strain over the length of the coil at full compression, regardless of the number of coils. The coils cannot be cancelling each other out; if they were, the number of coils would not matter. So exactly where is this torsion actually manifesting itself within the coil? * active refers to that portion of the spring that takes part in the spring's torsion or compression. It would exclude the clamped ends of a torsion rod, or a closed coil at the end of a coil spring. The examples are the paradox, as all the coils are twisted in the same direction when compressed, the only way for them to twist the other way is to be stretched instead of being compressed. "all the coils are twisted in the same direction when compressed"
So why doesn't the twist accumulate over the length of the spring? If a coil spring is a coiled up torsion rod (and it is), there should be a twist along its length that manifests itself as a rotation at one end in relation to the other end. There is a flaw in my original reasoning, in that the free ends of the open coils at the ends of the spring do not actually represent the torsional rotation of the inner coils. The first two illustrations attempted to show this rotation at the ends of the spring. The rotation actually is there at the open ends; it just doesn't represent the rest of the spring. I did some experimenting and attached little pointers onto the spring wire, perpendicular to the coil axis, at various points on a recoil spring. When the spring was compressed, only the open end showed rotation, just as shown in the above illustration. There was no rotation at any other point on the inner coils. The pointers remained perpendicular to the coil axis during compression. Excluding the end coils, you can view a cross section of the spring wire anywhere within the coil and observe no rotation as the spring is compressed. Contrast that with a straight torsion rod, where the amount of rotation at the free end increases with torque (stress), and also increases with the distance from the fixed end. Where does all that twist go when the torsion rod is coiled up? Why do we see no rotation at any point of the spring wire when viewing it in cross section? You won't see rotation in the way you are perceiving. Consider 5 hanging spring scales, adjusted for the ones hanging below it so they all show zero. Hang #5 from the bottom one, each scale will show the weight of #5. Or stack several scales on top of each other adjust to zero and place a weight on top, each will show the same, they are all working. With a compression coil spring such as a recoil spring, each coil has an equal resistance to be compressed, so when the weight required to compress one, all are compressed. If you put 2-#16 recoil springs end to end and compressed them to full compression they would still produce #16 of resistance. Now place them side by side and they will produce #32 of resistance. On this forum it has been repeatedly stated that a coil spring is the same as a torsion bar spring, but not literally true. This is only true in the concept of the material being stressed to a point shy of deformation where it returns to its original position. The same can be said of a leaf spring. Same but different. Coils allow more travel and is their value. The only way to increase or decrease a coil spring total weight at full compression is to change the design. Heavier or lighter wire, wind with greater or less distance between coils, diameter of the coils, etc. Consider 5 hanging spring scales, adjusted for the ones hanging below it so they all show zero. Hang #5 from the bottom one, each scale will show the weight of #5. Or stack several scales on top of each other adjust to zero and place a weight on top, each will show the same, they are all working. With a compression coil spring such as a recoil spring, each coil has an equal resistance to be compressed, so when the weight required to compress one, all are compressed. I understand that. The stress doesn't accumulate over multiple scales or coils in series. Total applied stress and the individual stresses for each of the series components are all equal. The same is true for straight torsion rods. Two (or more) rods connected end to end will each show the same amount of torsional stress at their individual ends for a given applied torque at the one free end. If one rod reacts with 5 ft lbs of torsional stress with 5 ft lbs of torque applied, each rod will react with 5 ft lbs of torsional stress. But in one respect, the coils spring and torsion rod both show an accumulation of strain. In the case of the torsion rod, the torsional strain is proportional to the free length for a given applied torque. If a 1 foot rod twists 10 degrees with 10 ft lbs of torque applied, a 2 foot rod will twist 20 degrees, etc. Likewise, the axial strain of a coil spring is proportional to the free coil length. If a 5 inch coil spring compresses by 1 inch with 1 lb of axial force applied, a 10 inch spring will compress by 2 inches, etc (again, for the same applied force). With coil springs though, as users, we are not interested in torsional forces, but axial forces. The coil spring engineers might be interested in the shear stress and strain, just as they might be with torsion rods, but only in the torsion rod is the mechanism of shear stress/strain utilized directly. With the coil spring, the shear mechanism is transformed into an axial one. Interestingly, there are coil torsion springs which are designed to react with torsion at the end. These typically have the ends of the coil formed into lever arms. The interesting part is that the spring wire itself doesn't respond by torsion at all, but by bending. These are in effect, coiled up leaf springs. On this forum it has been repeatedly stated that a coil spring is the same as a torsion bar spring, but not literally true. The model of the coil spring as a coiled up torsion rod is pretty universal as far as I can tell. The same torsional shear forces are used in analyzing and designing them for example. You won't see rotation in the way you are perceiving. So how should one perceive it? Last edited by megafiddle; 11th October 2018 at 16:47. Coil springs change diameter when compressed, or stretched. Coil springs, leaf springs, and torsion bars have a few similarities, and require similar material, but are quite different for the most part, their advantages, features and given properties are what govern their use. Coils being the most versatile as they can be wound to provide a multitude of load curve variations, and distance of travel. Glad you no longer see a paradox, and realize that the number of coils only affects the working length, and spring rate, not the total full compressed weight. This opens the door to using different springs to an advantage in the 1911. The problem is room for a spring, the GM has 1.625" of room for full compression and works pretty well with a reasonable life. The Commander has 1.125", shorter life, and the OACP only has .700" of space for the full compressed spring, a very short life. Note the same diameter wire, but full compression is different due to space between coils. By having more space to be compressed into the spring can have the coils closer together allowing the difference between the tension in battery and full recoil to be closer. This allows a longer life. The flat wire recoil spring unfortunately isn't being wound specifically for the 1911, but for Glocks and cannot take advantage of the recoil space of a GM. However they can be used to great advantage in the Commander, and OACP, and are an excellent choice for the Kimber Pro line that has .940" of full compression space and is is equipped with the short OACP spring, this spring can not provide much tension in battery and is common to develop chambering problems due to this poor choice. The flat wire springs can then be used to great advantage by cutting them to fit in the allowable compression space. By checking the weight of these spring at near full compression we can then cut them to a length that also nearly fully compresses and have the weight of choice at full recoil, and an increase weight in battery, eliminating chambering problems caused by weak in battery springs. This due to the fact that flat wire recoil springs can have many more coils to narrow the difference between the in battery, and full recoil position. Last edited by CAWalter; 11th October 2018 at 17:47. First, thanks for all the spring information. Very well explained. I did not explain my paradox as well as I should have. With a straight torsion rod, the total torsional rotation is proportional to the length, for a given applied torque. Suppose the rotation is 10 degrees per foot. A 1 foot rod will have 10 degrees of twist at the free end. A 20 foot rod will have 200 degrees of twist. A 36 foot rod will have a full revolution of twist at the free end. So you have a certain degree of twist per unit length, and this twist accumulates over length. More length, more twist. Now, assuming that a coil spring is a coiled up torsion rod (and I believe it is), the spring wire should also twist as the spring is compressed. But where is this twist? Why doesn't it manifest itself as a twist in the end (or ends) of the spring wire? Why doesn't it accumulate over a number of coils? 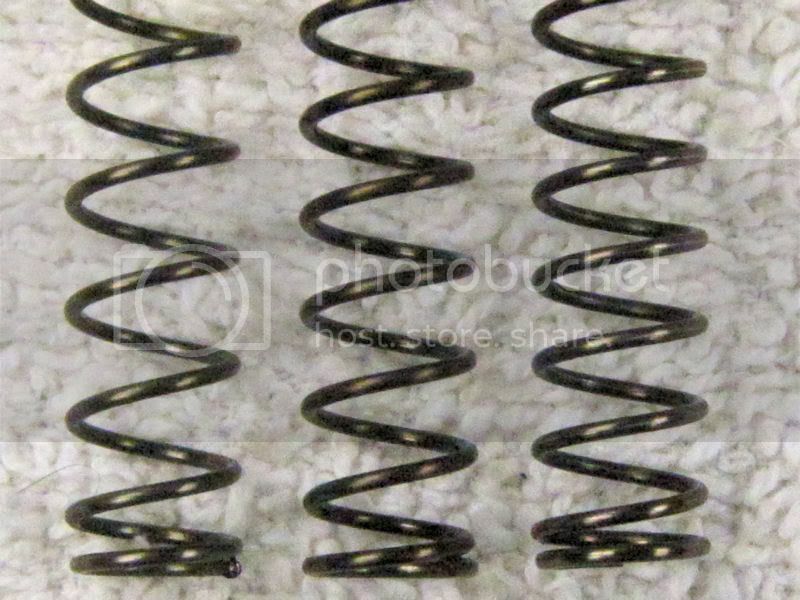 You can slice through a cross section of the spring wire at any point (excluding the end coils) and see no rotation as the spring is compressed. It's as if the ends of a coil section were stationary and the wire was twisting between them. Are you saying that the primary mechanism in a coil spring is bending, and not torsion? It's true that the coil diameter increases as the coil is compressed, but that is due to the coils lying in a flatter plane, more perpendicular to the coil axis. Spring wire or bar is the same in that it resists distortion to a yield point, and will return to its previous shape, or orientation. So leaf, coil and torsion spring have that in common. I am suspect that the analogy of a coil spring is nothing more than twisting torsion bar is taken so literally that it blocks understanding of a coil spring. Having a false belief is a stumbling block to understanding. We have established at least that the number of coils only changes the spring rate, not the total resistance. We know this because each coil has the same resistance, but what is each doing, what is it resisting? It is resisting deformation by compression. The coils were wound by forcing the wire's stress beyond the wire's yield point and wound into a coil of equally spaced coils to a relaxed length that provides an active length that satisfies the need. When the coil spring is compressed, the coils are forced to bend flat, this forces the coil diameter to be larger, they are all doing the same thing. The difference in diameter is not to be ignored, if a compression spring is in a tube equal to the spring's OD no compression will take place. As far as twisting the wire, the affect is there, and the coils are resisting to be twisted, by virtue of being in a coil when force is applied, and compress flat. I fail to see a paradox. Last edited by CAWalter; 18th October 2018 at 15:09. Stress is the application of force. Strain is the reaction of the material resisting that force. It does NOT imply motion in any way. It is often evidenced by motion, but not required.